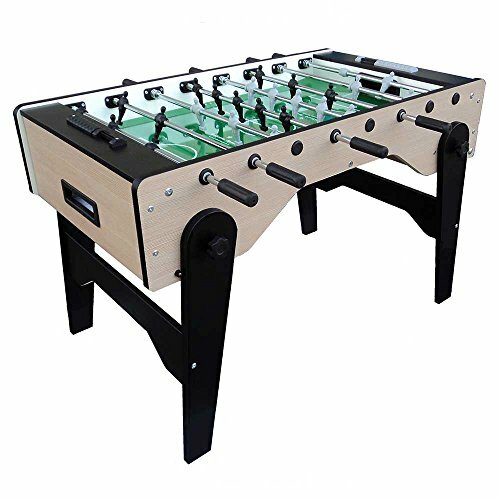 Elegant design soccer table with foldable legs to be kept under the table for those with space problems, keeping a minimum storage place when not used. Sturdy, laminated body. Foldable MDF legs painted and reinforced by 2 crossbars for perfect stability and easy storage. Practical and quick closing system with wheels on header to facilitate the movement of the table. Double chromium plated, telescopic rods. Telescopic rods (which do not come out of the table) make game play safe for players of all heights. 5 mm tempered glass playfield. Grey and black players made from high resistance plastic. Smooth plastic handles for a better grip. Ball recovery slits placed on both playfield sides. Supplied with 10 balls and 1 rods lubricant spray. International Trim: Rounded Player feet and sandblasted playfield glass. 2 year, bumper to bumper warranty. International Trim: Rounded Player feet and 5 mm sandblasted, tempered, unbreakable GLASS PLAYFIELD. For outdoor use.